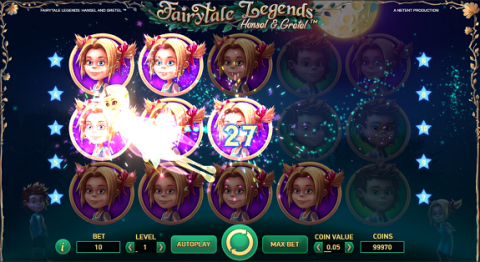 Net Entertainment (NetEnt) has some history when it comes to producing fairytale slots. You will already find the excellent Red Riding Hood and Jack and the Beanstalk in their online slots range. Hansel and Gretel fits the mould perfectly. This is based on a popular story, where 2 children get lost in the woods, find a house made of candy – and get captured by an evil witch. I’m not too sure how they get out of this spot, though that did not stop me from enjoying the game. As with many of the recent NetEnt titles, you’ll find a lot going on. This includes double-directional play, random features bought to you by a fairy, respins with wild reels a second screen picks bonus game and a free spins feature too. There are only 10 win lines in this game, a little unusual. Again, this did not take away from the game play. You can play Hansel and Gretel, along with 600 other games and slots (including 21 exclusives), over at www.unibet.com – my go-to casino for NetEnt, IGT and more. Check it out for yourself now! Many slots have 3D animated ‘hosts’ that watch the reels and react to your wins. This one has two. It makes sense after all to have both Hansel and Gretel involved. These are small animations, though they do bring a lot of character to the game. Both of the children appear on the reels too – as the highest paying symbols. This slot works in both directions. This means that wins can be triggered from the right to left as well as left to right. With only 10 win-lines in play, this adds some welcome extras chances to win. A lot of the symbols are candies. These look a lot like the gems from popular mobile phone games. Another symbol is the ‘FL’ logo. This stands for ‘Fairytale legends’ and triggers some of the surprise fairy features, these pay as scatters, and do not need to be tied to a individual win-line. You will also find treasure chests on the reels, these are for the bonus features. Respins first, these are triggered when you get a stack of ‘path’ symbols on a reel. First, any wins are calculated, then the wild reel stays in place, and the other reels spin again. If you get a second wild reel, this process repeats, again giving you a shot at some extra wins. A fairy will appear at random on occasion, and will help you get some extra line wins. In one scenario, a symbol at random appears on the reels each time the fairy waves her wand. This can sometimes lead to good coverage of the reels and a lot of wins. The other version is that the fairy will add the logos. This can give you some bigger scatter wins. When you hit 3 of the treasure chests on reels 1, 3 and 5 you get to pick one of them. This can reveal a candy house bonus, free spins bonus or a cash prize. The candy house bonus is the most interesting. You see a house covered in candy symbols, with a ladder of prizes up the side. Instead of picking the symbols to keep, you pick them and they are removed. What you end up with is 4 symbols. There are 4 prizes left, one big one and 3 small. You get to pick a fixed prize, or to gamble as to whether you’ll get a big prize. By contrast the free spins are fairly ordinary, though you’ll get a nice graphic involving a magpie along the way. You get 10 free spins, with the added extra of more reels capable of being the stacked wilds. All-in all, between the on-reel features, double-direction wins and the special bonus rounds you get a lot going on! As you will have come to expect from NetEnt, the graphics and overall production are excellent. The 3D animated characters are a nice touch, though the faintly glowing and sparkling forest scene in the background is also worth a look. Symbols and small touches like the shooting effects between the winning symbols are all very good. You’ll get some suitably fairytale music while you play. The Real Deal, or Just a Fairytale? I enjoyed this slot… and am still none the wiser as to how the kids got away from that house. Like all NetEnt titles, it has plenty of big win potential, plenty of features and the production is super-smooth. You can find this slot at www.unibet.com – one of Europe’s biggest brands, you’ll get 230 free spins with your first deposit (not on this game, though hey – that is a great offer!). Check out Unibet for yourself now!